Walked in of the street to purchase euros , rate given 1.077 against average 1.13. Only wanted £200 so loss minimal but be aware of poor rate of in store conversion. Thomas cook cards are not secure and would not recommend it to anyone. My card was involved in fraudulent transactions. I raised a service ticket with Thomas cook but the Thomas cook team never provided any justification of what happened. Worst card ever. It was useless in India in 2017 but since the worst issues were human error I gave it another try in Rio this tear. Huge mistake.happy to let you load up but not so keen to let you take the money out again., Card was again deactivated then when I called the person on phone couldn't understand me. I have just cancelled the card and have had different information from the first person I spoke to. Interestingly enough it is going to taker 5 to 7 days for the money to go back into my account.Crazy system. Horrible experience. Think twice before buying this card. Having just returned from New York, the reviews for this card there were really bad. I found it was the opposite! The card was really easy to use and accepted everywhere I went. Using a PIN number, signature or contactless payments was straightforward and wouldn’t hesitate in using the Lyk card again. Thomas Cook is the worst forex card service you will ever see. I have been using the card for almost 3 months. It is not re loadable online. They will only claim this. The actual procedure is: 1- Go to website and fill out the details. 2- You will be prompted to click get quote option . On navigating further you will be asked to visit a center. So if you are abroad and you want to reload the card you have to provide your parents/spouse id proof via email. 3- Then you get a payment link to transfer money. 4- Your card will be loaded only at the end of the day. 5-If its weekends you cannot reload your card. For other brand forex cards this reload is instant like an online payment and you don't have to provide details every time. If you are stuck you can never expect to reload your card immediately. This is the website to check your card balance https://www.thomascooktravelcards.com/. It does not work. So practically you cannot even check your balance. If anybody from thomascook contradicts the above points redirect them to suyashawasthi009@gmail.com. I am really pissed of by their service so am writing this. Please consider the above points before buying the card. moved sterling account to my multi currency card for varias practicle reasons;one being that activity on one account saves the inactivity fee on all others if on same card ! Then promised a closing statement(now lost to my view) and never materializes. My old single currency a/c (sterling) read easily-much like a bank statement with monies in & out BUT to my disbelief - new card format is a matter of luck or much work to check on ACTIVITY-the lack off which will incur monthly FEES- now craftily applied ! Iwill be getting rid of Th.Cook card as soon as is expedient !! WHILST ON HOL FOUND CARD HAD EXPIRED. NO REMINDER OR NEW CARD FORWARDED TO ME LIKE OTHER ISSUERS DO. LUCKILY HAD ENOUGH CASH TO MAKE DO. DECIDED TO CANCEL CARD WHEN HOME. EMAILED THOMAS COOKE BUT WAS TOLD TO RING THEM. WAS TOLD OVER PHONE I WOULD HAVE TO BUY A NEW CARD FIRST THEN PAY 7 EUROS TO CASH OUT THE CARD. ALSO THEY 'DIDNT KNOW' WHAT RATE THEY WOULD GIVE ME WHEN I CASHED OUT. I WAS TOLD TO GO TO STORE I GOT IT FROM. VERY VERY POOR. DO NOT USE THIS CARD. RIP OFF. ALSO JUST FOUND OUT THAT IF YOU USE CARD IN SOME BARS ETC THEY CAN ADD 10 / 20% TO YOUR BILL AS A TIP AUTOMATICALLY. RIP OFF. Would give 0 stars if possible. My grandad wanted to get $100 Was given an exchange rate of 1.17 even though the exchange rate was more like 1.30 (even from Thomas Cook). He is in his eighties and recently lost my Grandmother who would normally handle this sort of thing and I feel like he has been taken advantage of. Terrible response when I rang to query. Went into your Southsea branch to get some travel money. The exchange rate offer was - to be polite - absurd, I am sure the offer was 1.02.I went to Debenhams and got 1.12. If you are trying to ruin your rate of exchange branch, then you are going the right way about it. I will never go to Thomas Cook again. I wanted a card which would work online in USD. I went to the Thomas Cook shop in Worksop and paid in £200 and got $250 so it was easy to load it for the in store cashier doing it.When I arrived back home I checked the rate on on the Lyk site exchange rate I found that I had been cheated of 10 USD. I was unsuccessful trying to spend on internet and ATM would not allow me to check the balance. I do feel used and abused by Thomas Cook's Lyk card. I shall cash it in at the store and hope they do not rip me off again. Thomas Cook Maidenhead Branch,Never got told the exchange rate up front and then got swept along with the process and only realised how ripped off I had been after I walked out the door. Normally I'm very careful and check rates all the time. No wonder Thomas Cook did not have them displayed anywhere. I was told in branch that the Lyk card was brilliant and believe me it wasn't. Do NOT have one of these cards if you want reliability. Was told reloads go on immediately and it don't it takes upto 5 days.Then a payment which was already paid for came out again leaving is with no money in Canada for 6 days!!! I ordered currency online and then went along to the branch today to collect it. Only two members of staff were on duty and both were helping customers to book holidays. I was told that I could either sit and wait or leave and return later. When I asked what would happen if I returned later and they were dealing with new customers I was told that I would still have to sit and wait. Having reserved currency ahead this is an unacceptable level of service for a mere collection. The branch is clearly understaffed (especially for a Saturday). 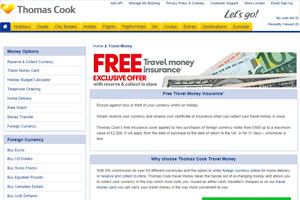 If Thomas Cook does not consider it profitable to maintain staffing on the currency exchange desk then an alternative arrangement clearly needs to be made, either by advising staff that they should deal with collections as they arise or by arranging timed collections when a staff member is guaranteed to be available. I won't be going back. I went into thomas cook in Alfreton and asked for $100.00 I was charged £84.00 I then checked on line as I thought it was expensive I checked with the lady on the exchange why it was £7.00 more expensive than the rate on there web sight. I was told its cheeper to buy on line I could have done it on my phone in the shop then walked to the counter to collect. How is that good service. I wont be booking any more holidays with thomas cook. Shocking customer service. I presented the card at two places in London and it failed at both places. Highly disgusting. Yet to hear from Customer Service. My mum went to change euros, I checked online for their rate which was 1.1192 (didn't see anywhere to say it was internet rate only) if this is the case it should be clearly stated not hidden somewhere! When she went to the shop she was given 1.02 rate, to which I complained and they did change it for her, but then complained they also took a lot of £1 coins from my mum which they shouldn't have done!! Last time I checked money is money, it was also counted in separate bags. Terrible customer services definitely won't be using this service again. With over 170 years of travel experience, holiday know-how and great currency exchange rates, Thomas Cook Travel Money has been the go-to place for holidaymakers wanting to buy their travel money for years. Over 75 currencies available all with zero commission.